Our July/August Viha Connection is now available online, with a bit of a delay. We are very happy with this new issue. 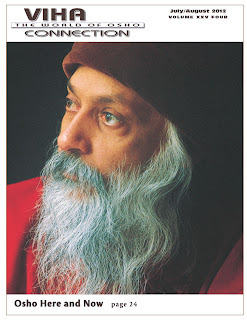 Thank you very much for the Viha Connection magazine and for the Osho books. Both were filled with sublime teachings that I have been sharing with everyone. In fact, after I’ve finished sharing them with the people in my block I donate them to the chaplain for others to enjoy. This is a very big step for me because my whole life I’ve been extremely possessive, both materialistically and in my relationships. I have learned so much from Osho’s teachings about life, love, joy, and compassion that I’m like a little kid experiencing life for the first time.